Deer poaching has reached epidemic proportions in some parts of Ireland, the Countryside Alliance Ireland (CAI) has said. The group said animals were suffering horrific injuries or death through illegal snaring, trapping and, in some cases, coursing with dogs. The latest reported incident was in County Tyrone on Saturday. 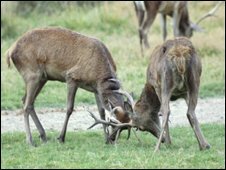 CAI, along with the Wild Deer Association of Ireland, has launched a campaign to highlight the problem. The WDAI said anyone witnessing poaching should not approach the poacher but note any vehicle registration details and tell the authorities. "Deer must be culled but only under controlled conditions, to restrict damage to forestry and farmland where over-population occurs," they said. It said culling should only be carried out by a certified deerstalker.